A Gantt Chart is a bar chart used for visually representing a project’s schedule. It is used in project management for illustrating tasks or activities in relation to time. In very simple terms, a Gantt Chart shows which tasks need to be completed and when they must be completed. When creating a strategic business plan, or when undertaking a new project, a Gantt Chart is always present. If you are starting a new project and you don’t have a Gantt Chart or any kind of PERT jotted down, then you might start rethinking about initiating the project in the first place. Creating a Gantt chart before starting a new project is like buying a map before going to a new city. Most people don’t purchase a map to plan their visits because it costs more, requires time and planning. Some people simply don’t buy a map because they like adventures. Well, if you have traveled before, then you know that planning ahead does require an initial investment (time & money), however, in the long run, it proves to be more cost-efficient (i.e: you get to see more places in less time). And adventures are nice, as long as you don’t have strict deadlines to follow. Similarly, a Gantt chart can seem a waste of efforts when beginning a new project. As you proceed further, however, you will better see what the various tasks are, when the tasks need to completed and how long it takes for each activity, thus using your time more efficiently instead of getting lost. Without going into much detail, the Gantt Chart was invented by Henry Laurence Gantt (Gantt. Shocker right?) during the years 1910-1915. At first, it was used to keep track of the employee’s work. If the worker managed to meet the daily quota it was recorded with a black bar. When the quota was not met, it was recorded with a red bar. Conveniently enough, it then evolved into a time-based model instead of a quantity-based one and was used during the First World War by American strategists. Pen & Paper – At first, Gantt charts were drawn on paper. Any changes to the flow of activities or duration of activities would require the whole Gantt chart to be redrawn. Web-Based Applications – The rise of the internet made way for web-based applications that allowed project managers to design, create and share Gantt charts in a shorter amount of time and in a more visually pleasing way. Nowadays, it would seem impossible to draw a Gantt chart without a software. In fact, most desktop or web-based applications used for Gantt charts, offer several templates from which to start. They also provide users with hints and mini-tutorials on what goes where and why. 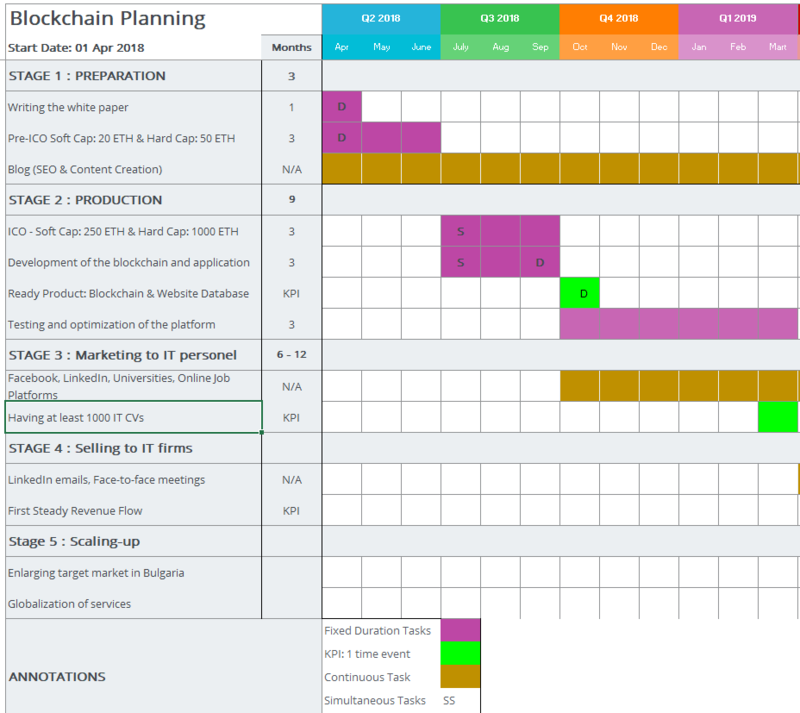 The example below shows a typical Gantt Chart for a blockchain based startup. On the left side, we have the different tasks, arranged according to their respective development stage. The time axis is split according to months and quarters. At the bottom, you can find the necessary legend or annotations for understanding the color scheme associated with the Gantt Chart. The rest is self-explanatory. The two main business components of a Gantt Chart are the tasks and the duration of each respective task. Tasks make up the vertical axis of the chart and they are written one below the other, the same way you would create a task list. The task list is generally divided into smaller blocks of tasks. You can think of the different blocks at different stages of the project development. For example, the first block of tasks can be related to Analysis and the second block can deal with Design. Usually, the different blocks are color-coded, meaning that tasks within the same block have the same color (and are usually found adjacent to each other). Each task has its respective horizontal bar which represents the duration of each activity/task. The edges of the horizontal bar indicate the time or date in which the task needs to begin and end. It goes without saying that the horizontal duration bars make up the horizontal axis of the Gantt Chart. Ultimately, you can think of the Gantt Chart as a multilevel color-coded pipeline that illustrates the precedence network of activities/tasks with their respective durations. Progress Gantt charts – the horizontal bar, denoting the time required for a task or activity, is shaded up to the point where the task has been completed. The shading is done starting from the left. If for example, a task is 75% complete, then the task duration bar will be ¾ shaded. It is great for providing a visual representation of the progress of each task. This way you will know which tasks are behind schedule. If a task was supposed to finish last week but it is only 60% done, this is already a red alert for management and you know that some kind of action must be taken soon. Linked Gantt charts – as the name suggests, this type of Gantt chart uses lines to link/connect tasks to each other. The connecting lines show that two or more tasks have some sort of dependency. The problem with this type of Gantt chart is that when a project has several tasks that are dependent on one the other, the chart can become cluttered. It works very well with simple workflows since it requires almost no training or experience to understand and analyze a Gantt chart. 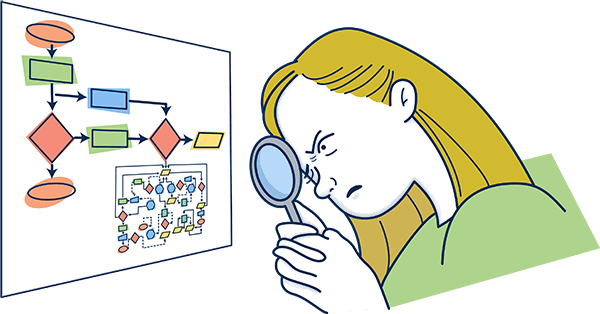 However, when the workflow is more complex (i.e: more tasks are interrelated), the benefits of a visual representation are lost. There are several ways of drawing a Gantt chart nowadays, and drawing it on paper is definitely not an option anymore. Because Gantt charts are used in project management, similarly to most projects, they have changed over and over again. You would be very lucky, and probably the first manager ever if your team meets all deadlines and completes all tasks on time. And even if that does happen, the scope of the project can always shift and the task list will require being redesigned. Therefore, most Gantt Charts are drawn using computer software. Despite there being many dedicated applications for drawing Gantt Charts, most visual tools online provide you with just about enough resources for such a task. Ideally, if you are trying to manage a small or medium project, you could probably find a free template online. That can greatly speed up the process of designing Gantt chart. The same thing we described above can also be done on Google Sheets if you don’t have an MS Office subscription. Asides from the traditional method explained above, you could install the Gantt Chart Generator extension for Google Chrome which allows you to automatically create a Gantt Chart with at most five levels of tasks. Draw.io has been one of our favorite open-source design and drawing tools here at Tallyfy. Asides from offering a vast number of tools for drawing almost any shape, it also provides comprehensive templates. As you might have guessed, draw.io is a great tool for creating Gantt Charts as well. It offers two complete templates which can be found under the “Table” section of templates. For some reason, draw.io categorizes Gantt Charts as Gantt Tables. Many project managers don’t like to spend a lot of time on shaping up a chart that will be changed continuously. That’s why templates can be a better option. And they look slick. Let’s face it, whoever created the template spent several hours for creating it, and all you have to do is change the colors of the table. When it comes to bigger, more complex projects, it is safer and necessary to use more professional visual tools such as Microsoft Visio. An elaborate Gantt Chart can help improve communication of detailed tasks and schedule details to various managers or employees involved in the project. Since Visio and Excel are both Microsoft products, it is possible to use data generated in Excel for automatically designing a Gantt Chart in MS Visio. A Gantt chart can be extremely useful when combined with a workflow management application like Tallyfy. It can help project managers outline and map the required tasks needed to get the project done. A workflow management app, on the other hand, can help you track who is doing what task and when. Let’s say you have a progress Gantt chart and you see that one task is creating a bottleneck in the pipeline and that the progress made is only at 30%. You can then easily navigate to your Tallyfy app and see which employees are not getting the job done. From there, you can take several decisions based on the management strategy you are adopting. One choice could be to delegate the task to another team. Another solution could be to add a fresh member that has performed well in similar tasks, to help out the existing team and give them the extra push needed for getting the job done. After all, project management is a very dynamic field and requires continuous decision making. You must be able to plan ahead of time, analyze the current situation and make decisions such that they are aligned with the project’s goals and objectives. Gantt charts were a tool invented more than 100 years ago, but they are still one of the most common tools used in project management. Whether you are a student trying to schedule your next steps in life, or a manager trying to keep track of a project’s progress, Gantt charts can be one of your closest friends. As you have seen above, they are very simple to make, require very little knowledge to understand and can greatly improve task scheduling and completion. The best way to learn about Gantt Charts is to make one. Try one of the free tools we mentioned above and let us know how it goes. Once you get a better feel for how it can be used in project management, try integrating Gantt Charts with workflow management applications such as Tallyfy to increase your task scheduling efficiency. If you think that we might have missed something regarding Gantt Charts, let us know in the comments section below.